Danny Chau: Of course it was Al Horford who cleaned up the mess. It had been him the entire game. He had five blocks. Three of them immediately followed a Horford jumper on the other end; three of them were so massive, he spilled into the sideline from his own velocity. The Hawks are full of what we’ve termed “situational superstars.” The beauty, and the inherent problem, of that is you never really know who it’ll be until it happens. We can talk about the Hawks being Spurs East until the end of days, but the conversation feels a little hollow without acknowledging the Tim Duncan–size void. This was Horford’s Duncan game. Horford was ecstatic; he was everywhere. Every dunk, every block, every midrange jumper felt bigger in the moment, so much so that I was stunned when I glanced at the box score in the third quarter and realized he had only 14 points. He finished with 23 points on 56 percent shooting, 11 rebounds, and five blocks. It’s the kind of Duncan-esque line that still manages to miss the mark on overall impact. The playoffs were always going to be the great test for these Hawks, who’ve had to come crashing down from their early-season heaven and enter an arena where paintbrushes are swapped for paintball guns. Last night’s game was an unusual, and occasionally gorgeous, slog. Horford turned in a star performance, but, in standard Hawks fashion, everyone had a role — even if it wasn’t the one you’d expect. When it appeared as though Kyle Korver was headed toward an oh-fer for the second time in the playoffs, he went from sniper to foot soldier, defending the perimeter as if that were what he was world-class at all along. Both teams shot under 40 percent for the bulk of the game, and there were very apparent peaks and valleys. It was a literal game of runs, going both ways, back and forth, with no team ceding complete control to the other. These are the games you want decided by the best player on the floor. There is a general aversion in Atlanta to putting that kind of spotlight on any one player, but if the Wizards are any example, the playoffs bring out a completely different animal. Last night, it was always going to be Horford. Chris Ryan: Is Nene’s blood type “caipirinha”? How do you let Al Horford get that rebound? I understand that Horford had a running start, and the hopes and dreams of Atlanta basketball running through him, but all Nene has to do here is jump. Scratch that! All he has to do is lift his arms! 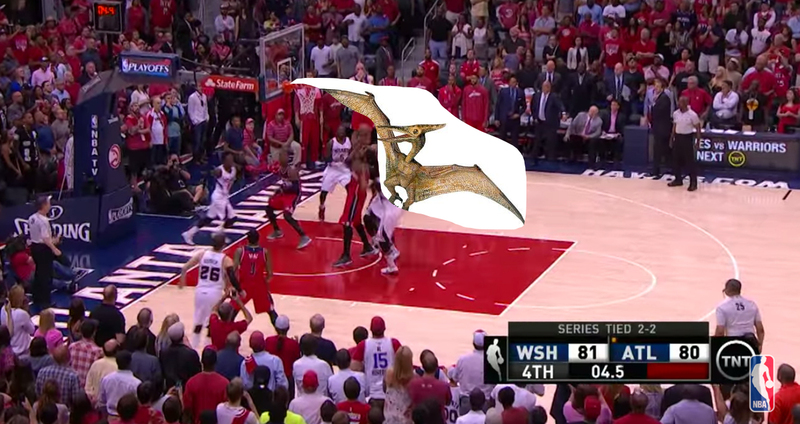 Instead, Horford does a really decent pterodactyl impersonation, and Atlanta wins a crucial Game 5. You could just see that, after three games in five days, Nene didn’t have any lift. I don’t know how Randy Wittman didn’t see it, too. Kirk Goldsberry: With five minutes remaining in the fourth quarter, the Hawks trailed by seven big points. Kyle Korver rose up and nailed this 3. The triple cut the lead to four and changed the trajectory of the game. A home loss in Game 5 would’ve likely sealed the Hawks’ depressing fate. Korver’s long-distance haymaker was the key bucket during a 14-0 run that would reverse the whole tenor of the Eastern Conference semifinals. Andrew Sharp: Focus on the positives. Focus. On. The. Positives. John Wall came back from the dead last night. If not for Chris Paul in Game 7 against the Spurs, it would have been the most impressive performance of the playoffs. He was playing with one hand like Jaime Lannister, and for most of the game, he was the best player on the floor. He is built differently from you and me, and even most NBA players. He won D.C. over for life last night. I want to fracture my hand in five places just to pay respect. Then there’s Bradley Beal. Remember three weeks ago, when everyone around the NBA was quietly shaking their heads, wondering what happened to Beal? Here’s what happened: The playoffs started, and he turned into everything anyone’s ever wanted from him. If anything, the games without Wall helped cement the progress. He’s more assertive than ever, and he’s getting to the rim. He’s still settling for some bad midrange jumpers, but at least he’s knocking them down. He’s a perfect sidekick to the best drive-and-kick guard on earth. Wall and Beal. Beal and Wall. And Otto. And Wall and Beal. This is the next five years. It could be worse. How did Nene miss that rebound? How? Beal & Porter had more rebounds than Nene and Gortat. Will this feeling ever go away? That was such a winnable game, and instead of building on a lead they had for two quarters, the Wizards screwed around and made dumb mistakes and kept a lifeless Hawks team alive. Washington has been the better team in almost every game. That would be a good sign, if the Wiz hadn’t lost most of those games. Now they’re down 3-2. Not great. 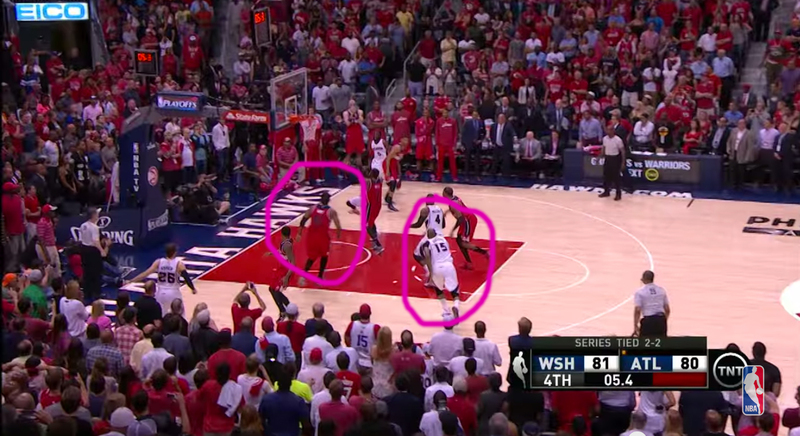 HOW DID NENE MISS THAT REBOUND? It’s not just Nene. The offense scored 34 points in the second half. That’s how the Wizards just wasted what should have been a legendary Wall game, another fantastic night for Beal, and another killer Paul Pierce dagger. Wait, Paul Pierce said WHAT? Fast-forward to Friday so everyone can stop thinking about what just happened. Jason Concepcion: The Warriors have a level they can reach, when everything is humming, that no other team left in the playoffs can hit. Their depth allows the team to shape-shift like a liquid-metal Terminator. Their defense and offense become a seamless feedback loop of devastation. At their best, they are a swirl of streaking bodies, passes, and baskets that, when amplified by their home crowd, takes on the irresistible force of an improvised tornado. 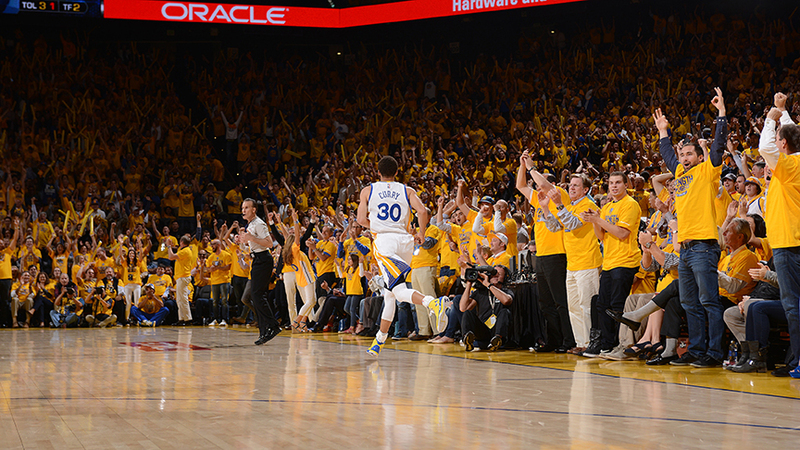 At the center of it all is Steph Curry. Here’s the mark of a special player: You can watch every second of every game of every season of his career and still feel like you haven’t seen everything he can do. Curry made a play in Game 5 that had me thinking of video games. And not sports video games, but shooters, where a player can slow down time and pick out targets while his hapless enemies struggle against the amber of un-heightened perception. It was like bullet time in Max Payne or the Pip-Boy 3000 targeting computer from the postapocalyptic Fallout 3. It was the dying seconds of the first quarter — 25-23, Memphis. Curry had momentum and had already hit three 3s in the quarter. Matched up with Beno Udrih on the wing, Curry hit the Slovenian with about five or six dribbles in the space of a second, like a drumroll. Time folded in on itself. Udrih’s entire being seemed anchored to the court as he tried to react to something he knew was coming but that he couldn’t even see. Curry rose up. Watching the dribble move into the shot and watching the shot arc toward the rim was like the feeling of knowing, intuitively, the next line in a children’s rhyme. There could be no other outcome besides the crisp rippling of the net and the explosion of the crowd. Buzzer. Warriors up by one. The crowd made it seem like 1,000.